It is the age of discovery and everyone is racing to claim the riches across the sea. Assemble your fleet, load up supplies, and deliver commodities to earn wealth and fame for your country in Race to the New Found Land! 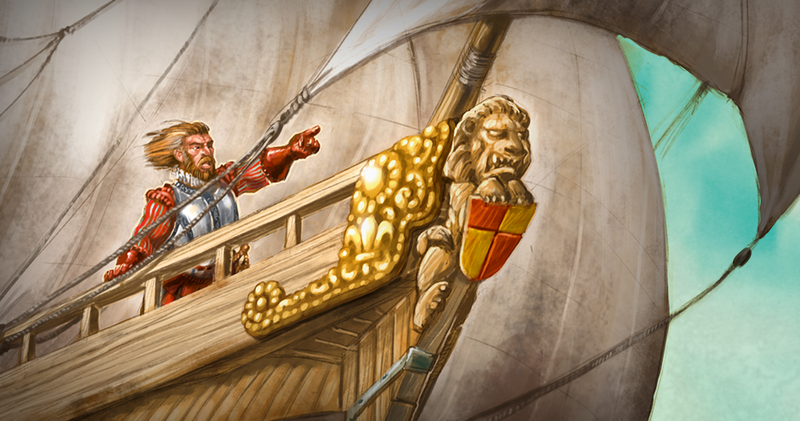 Set sail and pre-order your copy from our website or your local retailer. Use the ships in your fleet wisely, strategically assigning them to actions: load, settle , deliver, or discover. Every journey needs supplies before setting sail. Load your ship with wood, cloth, iron, or gold. Plan ahead to collect the goods you need, then deliver them to score points. When resolving the load action, look at the crate value on the assigned ship. In order to take the iron commodity, your ship’s crate value must be at least a 3. If the value is a 3 you can take an iron, cloth, or a wood. If the crate value is just a 1, you will load your ship with the wood commodity.